The Griffon is a sturdy toy dog that is often thought to look like an Ewok or Chewbacca from the Star Wars movies. Griffons are intelligent and lively companions with tons of personality. Energetic and inquisitive, they will follow you around the house all day and then jump in your lap the moment you sit down. They love nothing more than a good long cuddle on the couch. They also love to be spoiled. Brussels Griffons blend with the whole family—children and other pets included. They may seem a little aloof at times, but that quickly melts away—especially when the snuggling or games begin. They may have moments of headstrong bossiness, but nine times out of ten they’d rather get along and have fun. 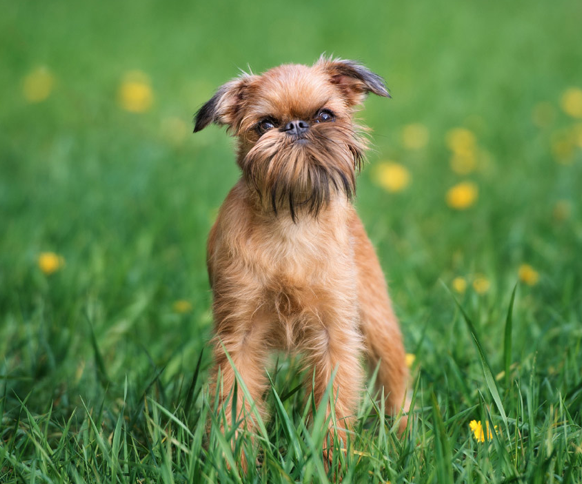 Lively, Excitable, Energetic, Inquisitive, and Friendly, the Brussels Griffon is a great pet! The Brussels Griffon is a very loving dog and is loyal and devoted to its human family, being extremely protective when necessary. They aren’t as loyal and loving to children as they often desire to be the center of attention. When there are children, it is best to raise them together for the best results. Your Brussels Griffon will be reasonably friendly with strangers, once they know they are welcome. They will get along well with other animals, though they don’t know their own size when interacting with animals many times larger. When it comes to training your Brussels Griffon, it is best done with positive reinforcement, though they tend to be a little more difficult to train. They are also intelligent, but easily bored. The Griffon’s energy levels and antics will entertain you for many years!